GREENSBORO, NC – January 17, 2017 – Qorvo® (Nasdaq:QRVO), a leading provider of innovative RF solutions that connect the world, has earned continued Trusted Source Category 1A accreditation through 2018 from the U.S. Department of Defense (DoD). The company is one of only five accredited suppliers for both gallium nitride (GaN) and gallium arsenide (GaAs). 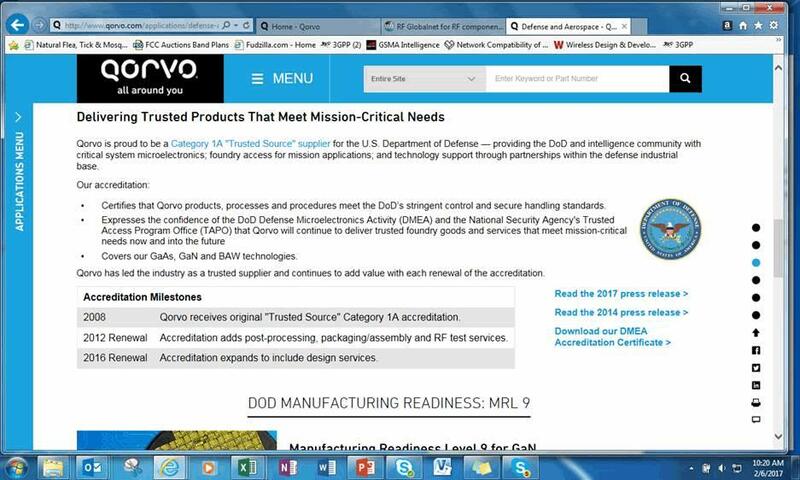 The accreditation reflects the confidence of the DoD Defense Microelectronics Activity (DMEA) and the National Security Agency's Trusted Access Program Office (TAPO) that Qorvo will continue to deliver Category 1A trusted foundry microelectronic goods and services that meet mission-critical needs today and in the future. Roger Hall, general manager of Qorvo's High Performance Solutions business, said, "This accreditation milestone signifies that the DoD and DMEA office trust Qorvo with national security technology. It also affirms to our commercial customers and partners that we will maintain the security of their intellectual property." Additional information about Qorvo's solutions for mission-critical applications can be found here: www.qorvo.com/defense.